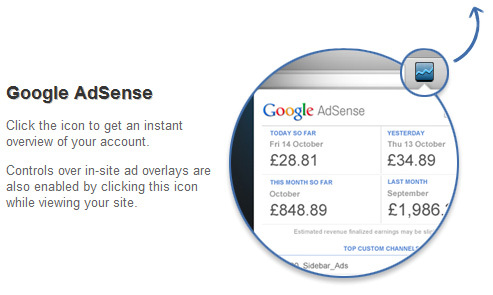 AdSense Publisher Toolbar extension adds a button on the top right corner of your Chrome browser. When you click on the button, it shows your AdSense account performance as a widget without leaving the webpage you are currently viewing. This extension shows you the summary of your estimated Adsense revenue for present day, previous day, current month ans the last month. It also shows the earnings for top 5 custom channels. There is one interesting feature of this extension that I like the most is that it shows you the Lifetime revenue that you have earned from Adsense. It means you can now check your total earnings from your Adsense account from the day you got your first Adsense cheque. To stat using this extension, you must first download Adsense Publisher Toolbar extension in your Chrome browser and install it. When you use this extension for the first time, you will need to grant the toolbar access to your AdSense account. To grant the access just sign in to your Adsense account. Access is only required for first time. Now the AdSense account overview widget will appear and show you an earnings summary, broken down by recent and all time performance as well as your top channels. Although it will be handy to have a toolbar, I don’t see any other use having that in the browser other than loading it.. I still prefer to check my stats by logging to the Adsense website.. Yesterday I installed this chrome extension.It is cool and useful for Adsense publishers. This is really cool! I can’t wait to use it.